“Peak Performance” addresses the principles that drive performance and the practices leading to great success. 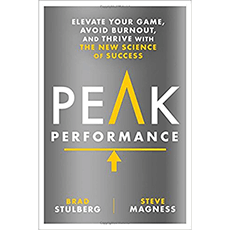 Health and human performance writer Brad Stulberg and Steve Magness, performance scientist and Olympic coach, show you how to achieve your best. The authors combine inspirational stories of top performers in various fields with the cognitive and neurochemical factors that drive performance. Foreword: Is Healthy, Sustainable Peak Performance Possible?